Old hearing aids are all you need to make a difference in someone else’s life. No super skills. No vast knowledge about the world. Just used hearing aids. How? Audicus Hearing Aids takes a look at several hearing aid donation and recycling programs that will gladly receive your hearing aids and assist you in the process of upgrading or renewing your used hearing aids. And yes, you might be able to change the world as well. One pair of refurbished hearing aids at a time. 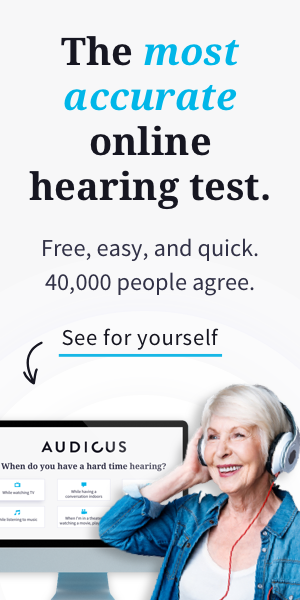 Audicus now accepts used hearing aids for donation! Audicus has partnered with Hearing Charities of America (HCOA) a nonprofit committed to helping the deaf and hard of hearing communities. Together we will collect hearing aids from the public, which will be upgraded. These refurbished hearing aids will be customized for low-income individuals. This partnership is part of HCOA’s Hearing Aid Project, which aims to bring together different organizations to provide hearing devices to people in need. The Hearing Aid Project currently offers hearing aid donations in New Jersey and will expand to other states soon. Hear Now is a hearing aids recycling program established in the United States by the Starkey Hearing Foundation. This program provides refurbished hearing aids to people with hearing loss, adults or children residing in the U.S., who are unable to afford brand new devices. Hear Now accepts any make or model, either used or unwanted, and your donation is tax deductible (they will send you a letter of acknowledgment upon receipt). In addition to hearing aids, Hear Now recipients also receive hearing treatments thanks to the program’s partnership with hearing healthcare providers across the country. Lions Clubs International runs HARP (Hearing Aids Recycling Program) by receiving hearing aid donations in several recycling centers (some of them located in opticians’ offices, libraries, and banks); donations are later upgraded and the refurbished hearing aids are given to people with hearing loss across the country. In addition to the United States, HARP recycling centers can also be found in Canada and Denmark. Other service organizations such as the Knights of Columbus and Sertoma via SHARP (Sertoma Hearing Aids Recycling Program) collect hearing aids donations. These are refurbished before being distributed to those who are deaf or hard of hearing. How About Young Ears and Used Hearing Aids? In terms of children services, the Center for Hearing and Speech devotes its resources and hearing aid donations to assist infants and children who suffer from hearing impairments. They do accept all makes and models, and the devices children can’t wear (i.e., in-the-ear type) are used for credit towards the purchase of loaner aids. Help the Children Hear is a project funded by the Rotary International Foundation, which focuses on providing refurbished hearing aids to recipients who live in Argentina, Honduras, and the Philippines. Similarly, The Flying Doctors of Mercy provide used hearing aids to children in Mexico. These projects aim to address children’s hearing impairment problems at their earliest developmental stages and provide them with new opportunities (schooling, counseling) to improve their lives. In case you need more information about these or other recycling options, do not hesitate to contact Audicus Hearing Aids. If you are already the proud owner of an Audicus hearing product, we are more than happy to help you find a program that accepts donations of used hearing aids. I have an excellent pair of used Phonak hearing aids that I would like to donate. Where can I drop them off in Klamath Falls or Medford, Oregon?? Also, do you take used prescription glasses? I would like to know where I can donate my late father n laws hearing aids too. Hi, I am 45 and was recently diagnosed with moderate to severe hearring loss. I have reached out several times to my local lions club over the last couple months. I have to receive a response. I am hoping you can help. I am supporting a family of 4 on the small income I make as well as going to school fill time to become a certified chef. My hearring loss affects my ability to hear my instructors and communicated with my fellow class mates and co workers. I also live in a rural area on a farm. Unfortunately my hearring loss has made it unsafe for me to take my children outside by myself due to the large population of rattle snakes. I am unable to hear a snake rattle. Please any help in the right direction would be so appreciated. My hearring loss has truly lowered my quality of like as well as my families. Hi, I have been tested and was told that my hearing loss is 40% in each ear and that was 10yrs ago. My health insurance doesn’t cover hearing aids and neither does Medicare. I would appreciate it if you could tell me where I can get a pair of hearing aids that are not too expensive in my area. Hi Barbara! We do just that, our hearing aids cost about 75% less than what you’ll find locally! We would love to help you out, please call us at 855-971-0451 or email us at [email protected]. My Mother in law is 91 and you have to actually yell for her to hear .All she lives on is her social security .We would be happy to donate them to someone else when she passes,but we can’t hardly communicate with her any more. Hi Melody! While we do not offer free hearing aids, our hearing aids are significantly less expensive than those that you would find locally. We may have options in your price range, please reach out to us by email at [email protected] or call us at (855)971-0451. Hi Randy. Read more about our donations program here: https://www.audicus.com/used-hearing-aids-donation/ If your mother-in-law is interested in obtaining new hearing aids, please don’t hesitate to reach out to our team! [email protected] or 888-203-1096. Thanks! My husband recently passed away.. his hearing aids are old.. can they still be donated somewhere? In Minnesota?. Hi there Barb. Read more about our Donations program here: https://www.audicus.com/used-hearing-aids-donation/. You can also contact our team at [email protected] or call us at 888-203-1096 to learn about where to send used hearing aids. I am a Nepalese citizen living in Kathmandu, Nepal. I have been a hard hearing for long & could not afford the prescribed device due to financial problem. I heard about your charity project & really appreciate your campaign. Can you help me in this regard ? Is there any way my husband 81 and myself 78 can get free hearing aides as we can’t afford to buy them and we can’t talk to each other because we can’t hear each oyher. My father passed away yesterday. We are planning to send in his hearing aids to try to help someone else. I have a nice set of used Moda II hearing aids to donate. Do I simply send them to the address shown above? I work with an outreach ministry, and we’ve known a homeless gentlemen for over a year that we take food too. He has very bad hearing that has gotten worse. I’m wonder if it is possible to obtain hearing aids for him at all. Thank you for your time. My dad passed away, I have the hearing aid, the batteries and booklets. Where can I mail it? I’m looking to donate. Hi Cindy- You can send it to Audicus Donationa, 40 Exchange Place Suite 1820, New York, NY 10005. Have a set of hearing aids to donate, some batteries also. Where I can I send them? would like to donate some hearing aids where do I bring them or mail them? I have two new hearing aids ( one never used, one used for a week) that I want to donate to a charitible 501 c 3 organization. My out of pocket cost $5, 000.00 Is the donation deductable? deductible? If so I want to donate before the en of 2015. I have four older BTE Phonak hearing aids, in working order, to donate. Please let me know where to do so. I live in Parkville, MD. Will I receive a notice that I donated aids that is acceptable to the IRS? I have old hearings to donate…Where can I drop them off as I live in Glenwood, Iowa Thanks! i have two hearing aids that my mother purchased for about 4000 dollars ,she recently died and looking to donate the hearing aids. I have a pair of hearing aids I would like to donate in Eustis FL. Please advise how to do so. Thank you. I would like to donate my old hearing aid. Is there a contact or address where I can find out how to do this? does your organization qualify for 501 k and provide tax deduction receipts for donated hearing aids? Hi Ross! We are actually implementing a used hearing aid donation program within the next few weeks through a non profit organization we will be partnering with. If you’ll hold onto your aids, we’ll be ready to receive them shortly! Thanks for reaching out. Your hearing aids may give the gift of sound to someone who could not otherwise access it. Thanks! Looking for hearing aids for my 80yo mom, Virginia Stroud. She lives in Lyman, SC, Spartanburg, County. She is on a fixed income and can’t afford aids. She still drives and works part time at Sams Club there in Spartanburg, so she is still very active and could benefit from aids. Thank you for any info in locating used aids. Have hearing aids that i paid 4000 dollars for in2007. I have a relative who is slightly retarded and needs a set of donated hearing aids. I t would be a bleesing if we could find them. I need a powerful behind the ear hearing aid. If you have any extra or not using kindly inform me. I am retired, and I lost my hearing aids, and I can not afford to buy new ones, could you please, let me know, where can I get some good used ones. thank you…. I am a retired senior citizen on social security. I am looking for used cheap hearing aids. I am 83 yrs old and cannot afford new ones. I live in Leander, Texas. Can anyone help me? Thank you. We are retired and my husband was helping his handy capped sister by removing ice storm limbs from her place so she could get out and I guess one of the branches pulled the aid out of his right ear and we could not find it. Any way we can get help with a different set or help with one. he had the one over the ear that has the tube inside it. it is a Destiny brand he has. I need invisible hearing aid for an affordable price. Is there a place on line where one can go to purchase a used hearing aid. When even the cost of the least expensive units is prohibitive, it would be great to find a place to purchase two used hearing aids for an affordable price. I have several generatons of hearing aid from years of needing better hearing. I would like to “recycle” them to new and needy neighbors.